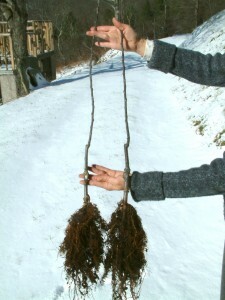 At Big Horse Creek Farm we offer custom-grafted antique and heirloom apple trees. We have an extensive collection of more than 350 heritage American apples, all of which are available for custom-grafting. We will graft your selection on your choice of dwarf or semi-dwarf rootstock in the spring, raise it in our nursery through the summer, and ship it to you in the fall as a strong, healthy one-year-old tree. 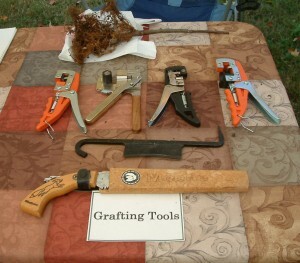 In addition, we can graft apple trees from cuttings you provide to us – from a backyard favorite to a homestead heirloom. We can advise you as to the procedures for obtaining cuttings, or scions, from your tree. For detailed information on collecting and shipping scionwood to us for custom-grafting see Collecting Scionwood. When you receive your trees, they will be one-year-old unbranched whips approximately 2-3 feet tall. The trees are shipped bare-root in a dormant state, ready for immediate transplanting. 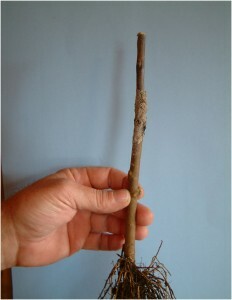 The following spring after transplanting, the trees will develop luxuriant foliage and start to acquire their first set of lateral, or scaffold, branches. With proper care, by summer’s end your trees will be 4-5 feet tall with a fully developed set of three to five scaffold branches. Fertilize and lime your trees (if necessary) according to the enclosed Planting Guide and you can expect to harvest your first apples in about 3-5 years. One-year-old Whips prior to shipping. Apple trees are generally very easy to raise successfully but, like all living plants, occasional problems may arise. We will be very happy to work with you to address any issues that might occur with your new trees. Please feel free to Contact Us with any questions or concerns you may have.